This is one of my favourite ways to cook Porcini. They really are at there best when braised like this. 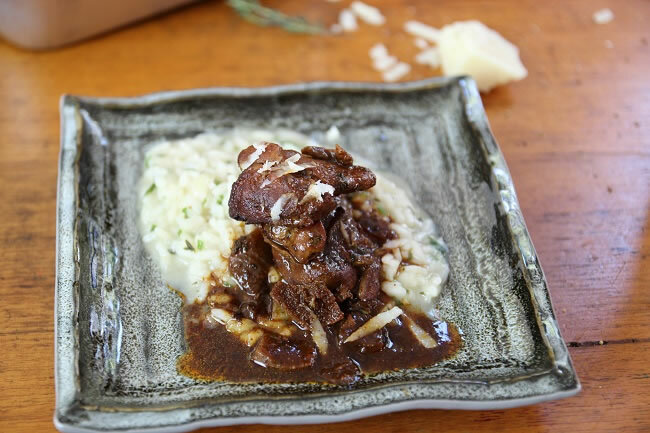 Try this recipe for Quick Braised Chicken Porcini and Thyme Risotto and see for yourself. Perfect for when you need something extra warm and delicious. 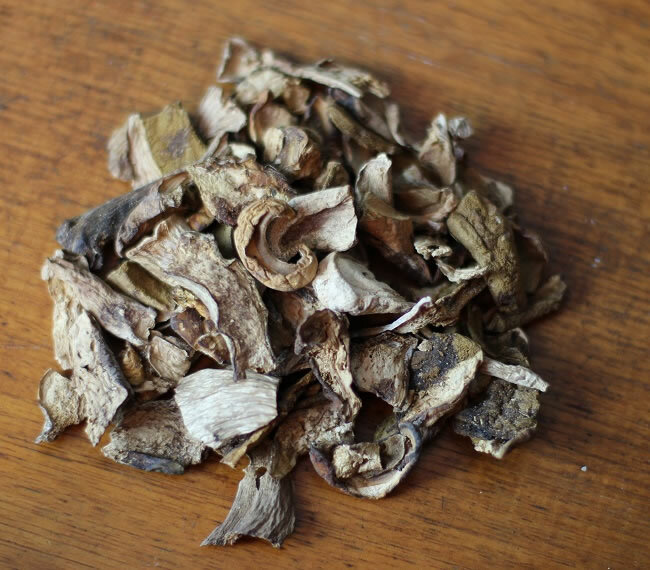 One of my favourite ingredients is Porcini Mushrooms. I can’t resist the smell of them. Someone…. stop me… before ….I ..hyperventilate. It’s a bit like smelling freshly roasted coffee, if you like it it is irresistible. Do you want to know a bit about Porcini Mushrooms? There are several types of Porcini with some different qualities, but all Porcini have a big, round, fleshy brown cap sitting on a short fat stem. Porcini are often found growing in association with certain varieties of evergreen and hardwood trees; pine, spruce, eastern hemlock, birch and fir trees. Like many other wild mushrooms, Porcini mushrooms continue to resist efforts at cultivation because of the symbiotic relationship formed with the trees under which they grow. They remain a true wild mushroom, picked straight from the forest floor. 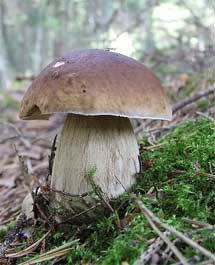 Porcini are also know by the names of Boletus edibus, Cep, Cèpe de Bordeaux, Champignon polonais, King Bolete and Penny Bun. The Porcini mushroom can grow singularly or in small clusters of two or three. Porcini mushrooms harvested in Italy are considered the true Porcini mushrooms. Its flavor is nutty and slightly meaty, with a smooth, creamy texture. This mushroom emits a yeasty aroma reminiscent of sourdough. 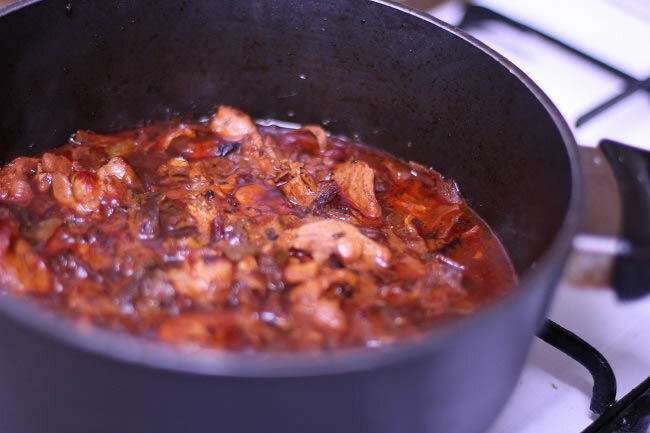 The secret to getting great flavour and colour is to really brown off the chicken and after adding the tomato paste make sure that is browned off too. 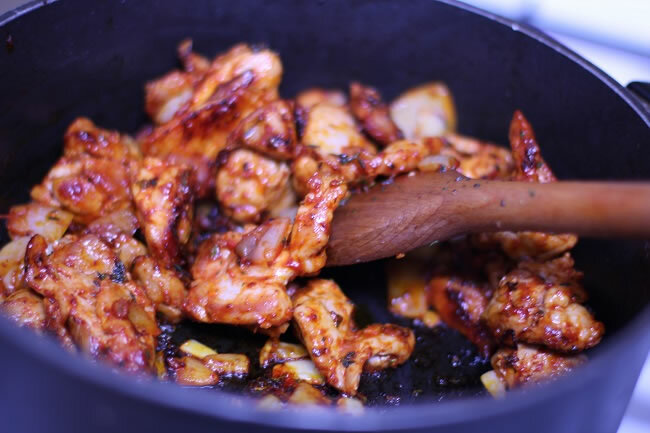 Put a thick bottomed pot on the stove and heat well before adding half or 2 Tablespoons of oil. Add the chopped onion, garlic, celery, carrot, anchovies and thyme and stir vigorously until softened. Add the chicken pieces and continue to stir on high till well coloured and browned on the out side. Drain the Porcini into a bowl , keeping the water. 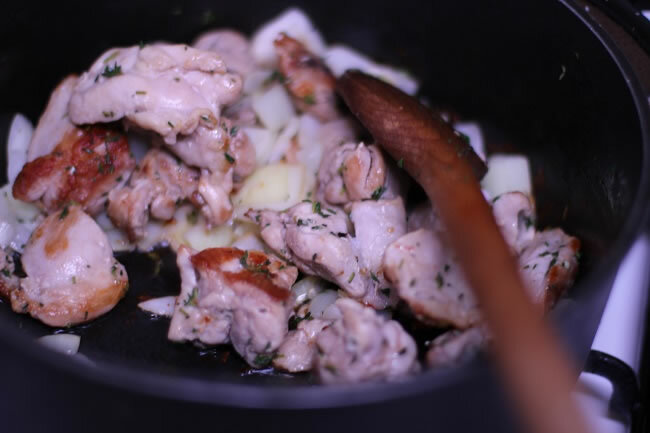 Add the mushrooms to the chicken with 1 cup of stock. Let the Porcini water stand for a minute so that any grit from the mushrooms will sink. Use about 1/2 to 3/4 of it and leave the rest behind. Now, let this simmer covered. The sauce will reduce by about 1/2. Put a pot on and add the olive oil, garlic,onion and thyme and soften (sweating for several minutes) before adding the rice and toasting. Keep this moving until you have added some liquid. 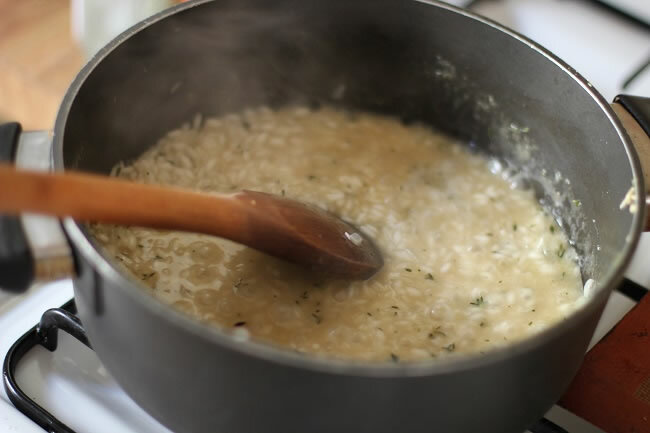 Once the rice is coated and warm add the white wine and let the bubbles subside, before adding 1/2 of the chicken stock. Stir well and turn it right down stir regularly. Once the first lot of stock has been absorbed and you have stirred well. Add another 1/2 of the remaining stock and continue. Stir frequently. This will take up to 20 minutes. Test the grains of rice, to make sure they are nearly cooked. If you feel it needs a little more time add a small amount more stock and stir on low. ( depending on your rice you you use you may need a little more or less than the full 1 litre ). That sauce is making me drool! Yum! I think I knew that porcini was pig related but never researched it. I love this braised chicken with the mushrooms. You’re a fantastic cook. The rich colour of that sauce makes me want to stick a fork into my computer Tania! WOW! What a link to have: well, would prefer to win a bit on tonight’s Lotto so I could really go shopping!! Love all the porcini facts: filed! Having been born in Estonia, N Europe am certain I picked these both there and later in Germany and they were yummy in Mom’s sour cream sauce [yup, the danger of fats was still a mystery!]. 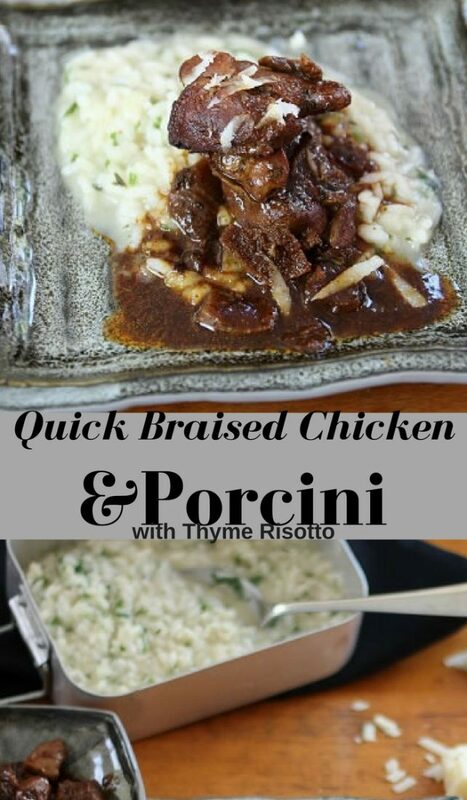 Lovely recipes: love risottos but have never used thyme or had the chance to try the Carnaroli type . . . I have a Sunday ‘sharing’ come up: this may be one!!!! Love the rich flavors in this! I too love the smell of dried porcini and many other wild mushrooms. 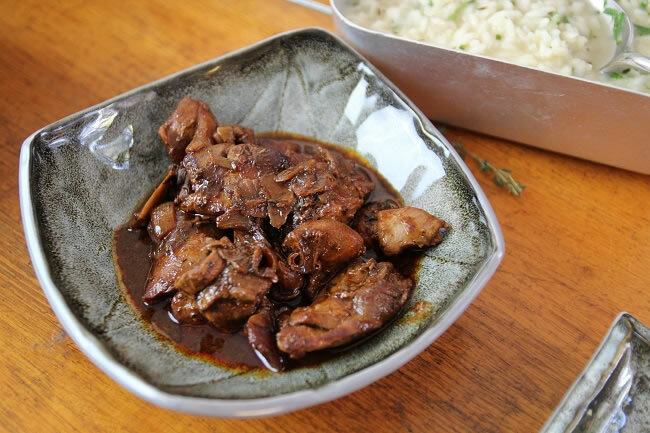 I will have to try your quick braised chicken… simply irresistible with the colour and flavours.. I love mushrooms with risotto, I always cook mine into the rice and it goes brown. I like the idea of keeping them separate. Porchini mushrooms also make great stock. I love porcini that much too but it seems they are on my list of can’t eat foods. I don’t want to believe them. Your dish looks good enough to eat off the page. I love porcini too but unfortunately am the only one here that does. I so get that smelling description though. I’m currently sticking my nose in a little jar of truffle salt. What is it about those little things?! I love porcinis too. I remember swooning over fresh ones in Italy at the markets! What a wonderful recipe, and I am loving the new look of the blog. Clever you, to put anchovies with your porcini mushroom sauce. Oh wow… I’d LOOOOVE to have this meal. Porcini is wonderful, and I love the flavor. The last picture made me want to have risotto. Haven’t had it for a while… Thanks for the great recipes! I made this in ” Cucina de Stefano ” last night and the bride swooned it was so good. 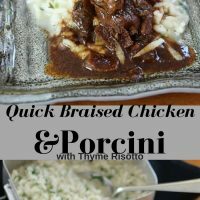 I used a nice rice called ” aquerello ” that I happened to have in my pantry! and found that it was better than most standard risotto rice types. A 50gm packet of really good Porcini was sufficient to carry the recipe. Thankyou and yummo! !